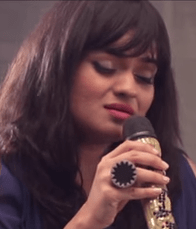 Aditi Singh Sharma is a leading singer and has given her voice in many popular songs. All her hits enjoy a warm response from the listeners and make a big contribution in raising the level of Hindi movies. Aditi Singh Sharma songs comprise sad, romantic, and dance hits. She has also sung unplugged versions of many popular songs. She has not only sung songs in Hindi movies but has also performed in live concerts and live shows. Some of her hit songs are High Heels, Sooraj Dooba Hai, Dhoom Machale Dhoom, Choomantar, Offo, and many more. BOTY has prepared a list of Aditi Singh Sharma songs. The arrangement of these songs is made on the basis of their popularity. Listen to these songs for free and enjoy your time. We will update this list with the release of every latest song of the singer. We hope you enjoyed listening to all the songs listed above. Aditi Singh Sharma new song of 2018 will be updated on the list on its release. To listen to all the other latest Hindi songs, keep visiting BOTY.